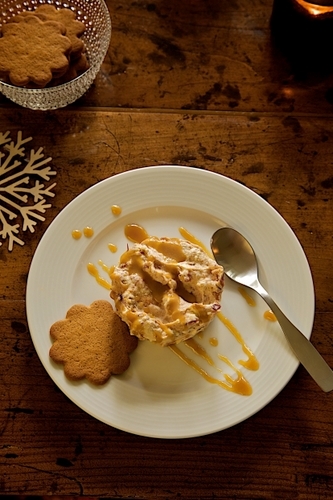 Here is the last of the festive recipes from Miisa Mink at the Nordic Bakery. 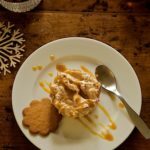 If you try this Nordic Bakery Festive Recipes: Frozen Lingonberry & Ginger Biscuit Cream with Balsamic Vinegar Sauce please tag #FussFreeFlavours on Instagram or Twitter. It is amazing for me when for me when you make one of my recipes and I really do love to see them. You can also share it on my Facebook page. Please pin this recipe to Pinterest too! Thanks for reading Fuss Free Flavours! To make the cream add sugar, water and egg yolks into a pan and bring to boil. Keep mixing well until sauce reduces. Remove from heat and set aside to cool. Add lingonberry jam and place in the fridge. Whip the cream in a separate bowl until it becomes fluffy. Fold whipped cream, vanilla extract and crushed ginger biscuits into the cooled down lingonberry sauce. Pour into six individual serving pots or one round pie tin and place into a freezer for a minimum of 2 hours or over night. Take the frozen cream out of the freezer 15 minutes before serving. To make the sauce, place all ingredients into a saucepan and slowly bring to boil. Simmer for 20 – 25 minutes mixing occasionally. Remove from the heat when sauce thickens. Pour hot sauce over the cold lingonberry and ginger biscuit cream and garnish with more ginger biscuits. Serve immediately.